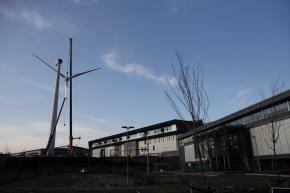 The Nuclear AMRC now boasts a new low-carbon landmark, with the installation of a 99 metre wind turbine. Sited immediately outside the Nuclear AMRC research factory at the Advanced Manufacturing Park, South Yorkshire, the Powerwind 56 turbine will significantly reduce the carbon footprint of the centre. The turbine has a rated power output of 900kW. Onshore wind turbines in the UK typically operate at an average of 25% of the rated output, so the Nuclear AMRC’s turbine should generate an average of over 5000kWh per day, equivalent to the electricity used by 500 households. 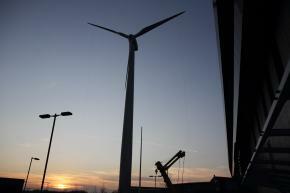 The Powerwind 56 turbine is the first of its kind to be installed in the UK. The turbine includes advanced design features adapted from the largest multi-megawatt designs, including a water-cooled generator and full-scale converter which allow smooth operation in rough conditions and minimise the risk of noise and visual disturbance. The turbine took a week to install, with the 56m-diameter rotor head attached to the 71m tower in the afternoon of Saturday 19 November. Final testing and commissioning will take around a month. The Nuclear AMRC development also includes ground source heat pumps, with a capacity of 320kW, to provide heating for the centre. The building has been designed to ‘Excellent’ BREEAM standards for sustainability, emphasising the contribution that nuclear power can make to a mixed low-carbon economy. The Nuclear AMRC’s turbine is the largest to be installed on the Advanced Manufacturing Park, formerly the site of the Waverley colliery, on the boundary of Sheffield and Rotherham. The turbine is visible from the M1 motorway around the Tinsley viaduct – formerly the location of a coal-fired power station whose landmark cooling towers were demolished in 2008, and where construction will soon start on a new biomass power plant. The new Advanced Manufacturing Institute Training Centre will help close the skills gap in the UK nuclear manufacturing supply chain. The University of Sheffield Advanced Manufacturing Institute (AMI), which includes the Nuclear Advanced Manufacturing Research Centre (Nuclear AMRC), has secured government backing for a new Training Centre to open in autumn 2013. The Department for Business Innovation and Skills has awarded £9.2 million from the Regional Growth Fund to establish the Training Centre, which will provide training for companies along the supply chain in high-value manufacturing sectors. The AMI Training Centre will provide training in the practical and academic skills that manufacturing companies need to compete globally, from high-level apprenticeships through to Doctorate and MBA level. Over 200 apprentices will enter the AMI Training Centre each year, where they will receive nine to 12 months of intensive skills training. The training schedule will be guided by the AMI’s industrial partners (including Nuclear AMRC member companies) and participating companies. 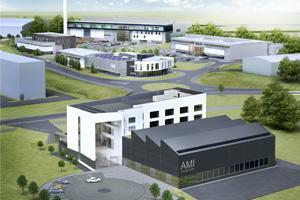 The AMI Training Centre will be based in a new 5,000 sq m building, to be situated close to the Nuclear AMRC and AMRC with Boeing on the Advanced Manufacturing Park, South Yorkshire. It will open for business in September 2013. Total costs for establishing the Training Centre are £20.5 million, with the remainder coming from participating companies and other funding streams. The Nuclear AMRC is developing a programme of skills and training services to ensure that the UK nuclear manufacturing supply chain has the skills required to compete in the global market. The Advanced Manufacturing Institute (AMI) is a new self-standing centre for research, knowledge exchange, teaching and learning within the academic structure of the University of Sheffield. AMI was created in 2011 in response to the continued success and growth of the University of Sheffield Advanced Manufacturing Research Centre (AMRC) with Boeing. It includes the AMRC with Boeing, the Nuclear AMRC, and the new Knowledge Transfer Centre (due to open in the new year).